They say that everything is bigger in Texas, and that also includes pride for the United States of America. 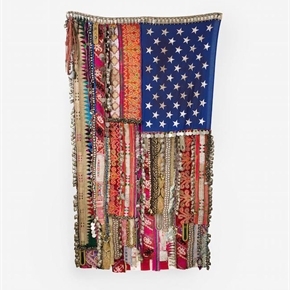 For a handful or so of the 100 art dealers that exhibited at the 10th edition of the Dallas Art Fair, which runs through April 15th at the Fashion Industry Gallery, the American flag also served as a works of art that carried a form of social commentary on the state of the Trump’s America. At the dawn of the Iranian Revolution, a four-year-old Sara Rahbar — the artist currently has an exhibition at Dallas Contemporary — fled Iran with her family to Turkey before seeking asylum in the United States. It was while in school that the young Rahbar became acquainted with the American flag as she recited the Pledge of Allegiance with her classmates daily. 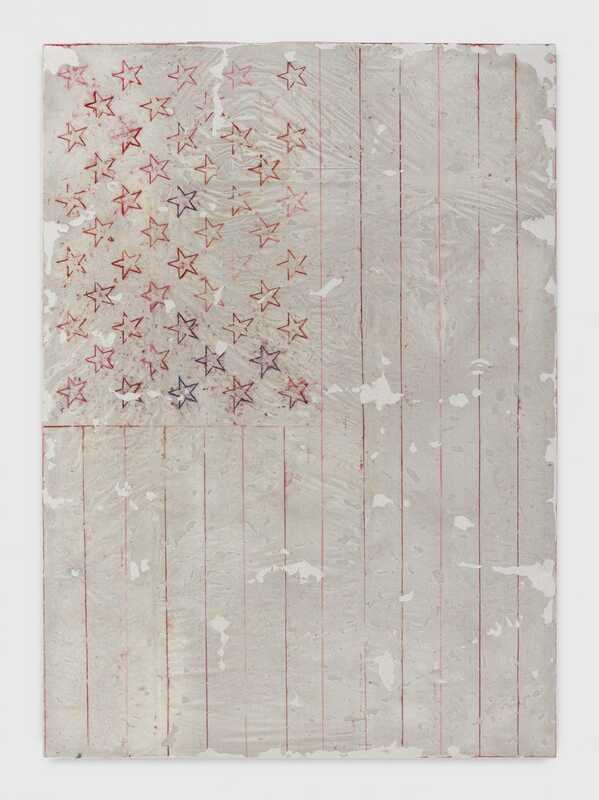 After 9/11, Rahbar began thinking about the meaning of the flag, and started adorning them with ephemera that she picked up from flea markets. In Flag #57 Rahbar collected beautiful fabrics from across the Middle East and South Asia, adorned the American flag with them, and commenting on the rich history of immigrants from those regions to the United States, where they fuse together two cultures — the one from which they came, and the one that exists in the country they live in. A Logo for America (1987-2014), 2016, by Alfredo Jaar, at Galerie Lelong & Co. In 1987 Chilean-American artist Alfredo Jaar staged a happening in Times Square with Public Art Fund where he took an outline of the United States, and put the phrase “THIS IS NOT AMERICA” over it, and posting it in lights on a billboard there. In the next sign, a map of North America and South America is on top of the word “AMERICA.” Jaar was commenting on the fact that the United States isn’t the only America in the world. The artist took two photos from that happening, which both show an illuminated red, white and blue flag next to the billboard, and put them atop two light boxes in this editioned diptych. 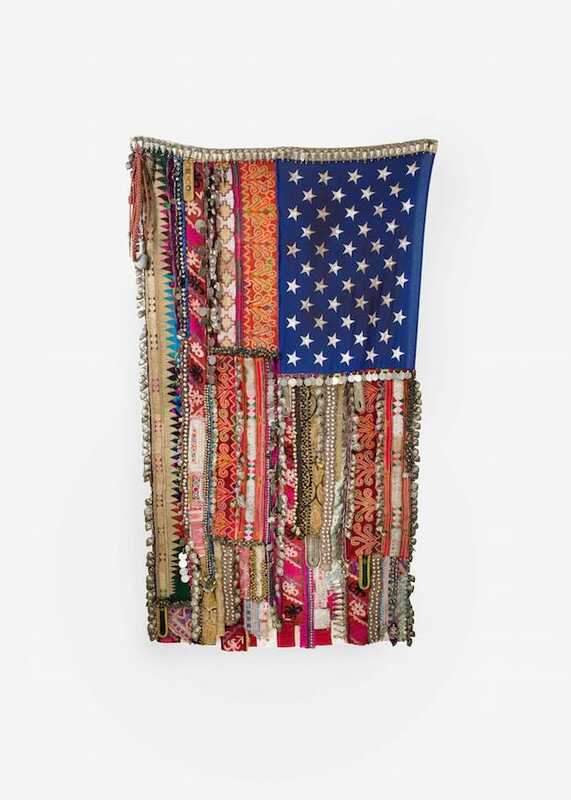 Mel Ziegler has been exploring nationalist symbols throughout his career, and, starting in 2009, the artist traveled around the country and exchanged 50 flags — one for from each state — giving a new flag to the owner of the weathered one he got in return, forming a narrative between himself and the original flag’s owner. 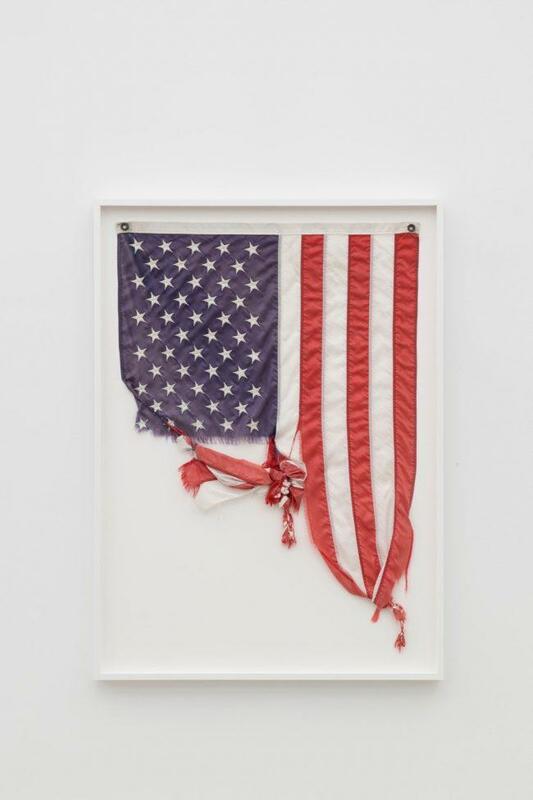 Ziegler framed each flag in the vein of Duchamp’s readymades, turning the found objects into works of art. As the title implies, Ziegler acquired this flag from a Texas ballpark. JPW3 coated a blank canvas with wax before drawing a faint red and blue outline of the American flag’s stars and stripes. 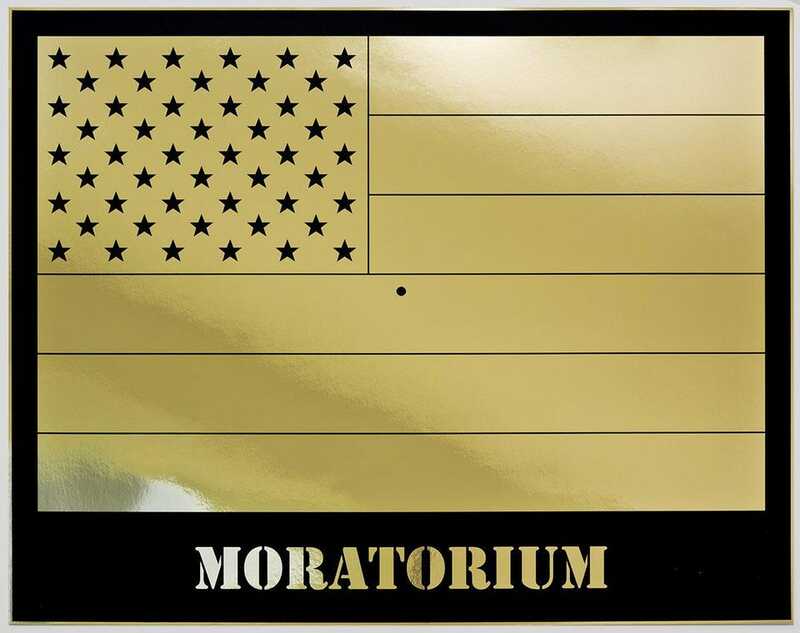 The flag is devoid of any color, and in a way, comments on the depleting sense of American pride, reflecting the current crisis in the United States through an absence of vibrant hues.